Aberdeen, Ohio, is thirty miles southwest of the ancient Serpent Mound earthworks. October 10, 2003 Aberdeen, Ohio - Since August, I have reported about two extraordinary crop formations of unknown origin in Ohio soybeans. The first was near the ancient earthworks known as the Serpent Mound between Locust Grove and Peebles, Ohio. The second was on Paint Creek island near the ancient Seip Mound in Bainbridge, Ohio, about 30 miles north of the Serpent Mound. 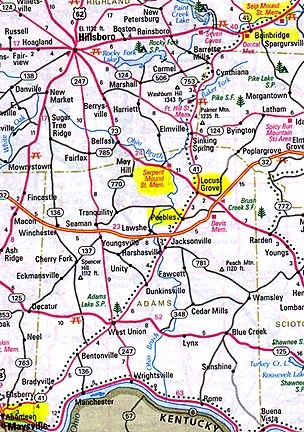 Paint Creek was reported September 28 by a local newspaper after a pilot flew over it. The exact date of its creation is not known, but investigators think it was probably created the same time as the Serpent Mound pattern first discovered on August 24, 2003. Next PostNext Is Our Universe Finite and Shaped Like A Dodecahedral Sphere?